Like most kids, Stephen Iwerebon participated in youth sports like basketball, cricket, running, tennis and soccer. 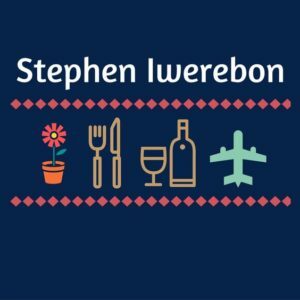 While he still enjoys getting together with his friends to play the occasional game of tennis, Stephen Iwerebon has one true love that has always scored higher than tennis and that is his interest in cooking. Cooking is one of Stephen’s favorite pastimes and he can often be found creating fun recipes and crazy new concoctions from whatever he could find in the kitchen. As a young boy growing up, Stephen’s parents, like most, were just happy knowing that he was a boy that loved to eat all of his fruits and vegetables. But Stephen, unlike most children, was always willing and even anxious to try the new things that his mom had prepared for him, and we’re not just talking about fancy cooked vegetables or gourmet sauces that the average child would turn their nose up too. We are talking about the kind of cuisine that a kid would never dare eat; like animal skin parts, cow tongue and chicken feet. The thought of trying such things, excited Stephen and he would even brag about it to his friends. But, Stephen Iwerebon’s love for food did not stop with just eating it, No sir. As with most things that interested him, Stephen wanted to know more. He wanted to know how a few simple ingredients, when added with something unusual like an animal’s tongue, could become such a savory dish. With his interest piqued, Stephen began asking his parents if he could help them prepare the family dinner. He rolled up his sleeves and worked diligently alongside his mom, all the while asking her questions and before long, offering suggestions. What’s more, he had no problem eating what he helped to create when it was put in front of him. Stephen Iwerebon had become a true connoisseur of, not just eating food, but preparing it too. While he was still in school, Stephen had been afforded the opportunity to study abroad. Excited for this new adventure in his life, Stephen quickly accepted the opportunity with the exuberance he put in to most everything. He was excited to learn about other cultures and how they lived, worked, socialized and of course, how they ate. With eyes wide open and a thirst to learn, Stephen headed off to Europe. It was at this point in his life that Stephen took an interest in British cuisine and culture. In all his travels in Europe over the years, he has learned how to prepare many new recipes and gourmet dishes he had never tried before, and while he was there, Stephen Iwerebon learned he had another hidden passion in wine tasting and has since incorporated that knowledge to go along with his knowledge of cooking. Currently, Stephen Iwerebon is enjoying his life as a home chef, wine enthusiast, and has since added to his title, avid gardener. While Stephen does enjoy growing some of his own ingredients, there is still a variety of fruits and vegetables that he needs uses in his recipes that does not grow. For these things, Stephen enjoys selecting and purchasing only produce organically grown and sold by local farms. Knowing that the majority of his ingredients are coming from local family farms makes Stephen Iwerebon all the more satisfied with his tasty, healthy dishes. From his experiences abroad and elsewhere, Stephen Iwerebon has also become a great wine enthusiast. He has sampled many varieties of wine from around the world. Some of his favorites include Port wine from Porto, Portugal as well as Pinot Noir and Merlot based in France. Outside of his personal hobbies, Stephen Iwerebon has found great success professionally as a business consultant for a diverse group of entrepreneurs, business leaders, CEOs, and aspiring business owners. He enjoys working one on one with these professionals to help identify effective and innovative strategies to help grow their companies, big or small, in an ever changing fast paced business world.